Louisiana music man Traci Borges is most famous for his Knight recording studios in Metairie, LA where he recorded people like Eddie Bo and Jean Knight in the 70s, and which appear to be still open. 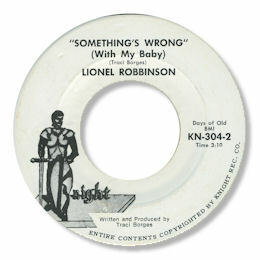 He established his own Knight label as well and the most prolific artist he cut was Lionel Robinson. Funk fans may have heard Robinson on "Steppin' Out" (mostly via the instrumental B side) or "Baby Let Me Do My Thing" which has it's origins in King Floyd's "Groove Me". But Robinson was a good singer on the slower material as well, his high baritone flexible and with a strong tone. I think he was at his best on the ballad Something's Wrong (With My Baby) which, as you can hear, is a quite different number from the Sam & Dave classic. I very much like the way the alto sax meanders it's way round behind Robinson's voice and the manner in which the whole thing is held together by the organ. But perhaps the best aspect of the song is the way Borges messes around with the tempo, slowing it right down on the chorus only to rev it up again on the next verse. Later in the decade Robinson had another very fine 45 out under the name "Lonnie" for another Borges label Sunshine Movement. 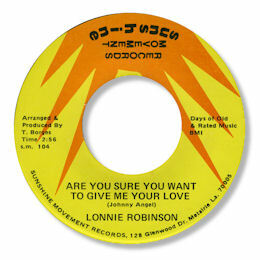 Are You Sure You Want To Give Me Your Love was first cut by Borges on the lovely tuneful song's author Johnny Angel, but Robinson does a really bang up job over the same backing track as the original. Just love the melody. UPDATE ~ My great friend Greg Burgess points out that the Angel and Robinson cuts of this lovely number don't just use the same backing track but are also so close vocally they might be the same singer. That would make sense as "Johnny Angel" is obviously a stage name.